Habit: Annual 0.5--3 dm. Stem: 0.2--1 dm, glabrous except for few glands proximally. Leaf: basal; blades 0.5--2 cm, round to round-reniform, densely white-tomentose abaxially, woolly-tufted to +- glabrous adaxially. Inflorescence: 5--25 cm; branches glabrous; peduncles spreading to +- recurved, 0.5--3 cm, thread-like, glabrous; involucres 0.6--1.2 mm, 0.7--1.3 mm wide, glabrous. Flower: 0.8--2 mm, hairy; perianth yellow then white to rose, outer lobes cordate, in age sac-like basally, inner spoon-shaped. Fruit: generally elliptic, 0.8--1 mm, glabrous. Chromosomes: n=20. 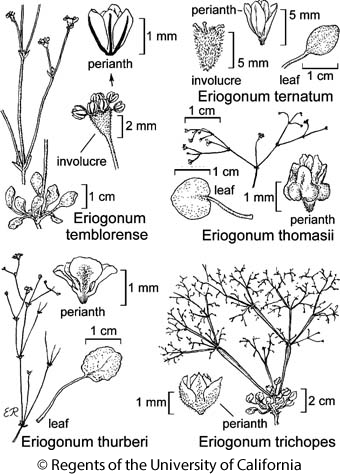 Citation for this treatment: James L. Reveal & Thomas J. Rosatti 2012, Eriogonum thomasii, in Jepson Flora Project (eds.) Jepson eFlora, http://ucjeps.berkeley.edu/eflora/eflora_display.php?tid=24949, accessed on April 19, 2019.